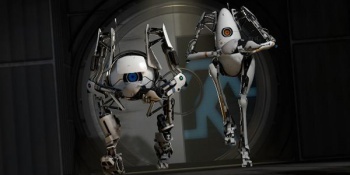 Electronic Arts has signed a deal with Valve to distribute the upcoming Portal 2 through its EA Partners publishing arm. Coming out in April barring a Valve Time interruption, Portal 2 will feature all-new puzzles, Aperture Science test chambers and of course a reunion with the smooth-talking GlaDOS, the sexiest thing to come out of an artificial intelligence lab since Shodan. EA announced today that it has signed a deal with Valve to distribute the game at retail through its EA Partners publishing arm; digital distribution of the game will be handled by Valve through its Steam platform. "Portal 2 is Valve's most innovative title in the company's history and will be launched with a first-class launch campaign this April," said Doug Lombardi, Valve's vice president of marketing. "We're excited to be working with Electronic Arts to deliver this title as we expand our platform strategy to include the Mac and PlayStation 3 platforms." The EA Partners program has resulted in publishing and distribution deals between Electronic Arts and a number of high-profile developers along with Valve, including Crytek's Crysis series, the Rock Band games from Harmonix and Epic's upcoming Bulletstorm. Portal 2 will actually be the fourth Valve game distributed at retail by EA Partners, following The Orange Box and the two Left 4 Dead games. Portal 2 is scheduled for release on April 21 for the PC, PlayStation 3, Xbox 360 and Mac.